Since you guys and gals seem to be appreciating my posts relating to blog advertising, I figure I might as well keep that theme going for a bit. It is an area that I feel quite comfortable with since I have experience on both sides of the business. If there’s something in particular you want me to cover related to blog advertising or anything else to do with blogging, just let me know. Or if you want to contribute a future blogging tips post yourself, that would be awesome too. It’s been a while since I’ve had a guest writer for this series. A lot of bloggers want to make some money for their blogs via direct advertising. Unfortunately they often don’t realize what advertisers are looking for. To do well with blog advertising you have to put yourself in the advertiser’s shoes. Know what they want and you can work at improving your blog to meet those needs. Then you can get more ads and charge more money. The first thing that many advertisers check is a blog’s Google PageRank. This gives them a good idea of how much a link from your blog will help their SEO. Since it’s a metric directly from Google, it is assumed that it is more geared towards how Google’s values links. It is far from a perfect metric though. For one it currently only updates every 3 months. So a blog’s PageRank can be outdated if you’ve been doing a lot of marketing. Secondly since it is a 10 point scale, it is a very vague rank. To improve your PageRank, refer to my post “Google PageRank, Not Just About Links“. PageRank is primarily about how many links are pointing to your site and how strong they are. In simplified terms, the higher a page’s PageRank, the better it would help your own PageRank to get a link from that page. Do be aware that onpage issues can limit your PageRank as mentioned in my other post. Most advertisers are particularly interested in blogs that have a PageRank of at least 3. The higher you get your PageRank, the higher you can charge for advertising. Since PageRank is an imperfect system, a lot of advertisers instead rely on Domain Authority and/or Page Authority. You can check those stats on Open Site Explorer from SEOmoz. They use a 100 point scale that updates much more frequently than PageRank. While it is largely focused on links to your blog, it also considers other factors that should affect your Google rankings. So to improve these stats, do the same kinds of things you’d do to improve your PageRank. Try to get lots of quality links from lots of sites. Also make sure there are no on-page problems such as slow loading speed, w3 validation errors, broken links, etc. Personally I have not been using Domain Authority and Page Authority long enough to know what a good score is. Try comparing your scores against other blogs to get a general idea. I have heard of some advertisers looking for a Domain Authority of at least 30, but the higher the better. To a lesser degree some advertisers also look into how much traffic a blog receives and what level of user engagement exists. For checking traffic, advertisers might check a blog’s Alexa Ranking to get a rough idea of how popular a blog is compared to others. It may be the most accurate publicly available measure of your blog’s traffic. Some advertisers do straight up ask how much traffic you get, but that is quite rare. To improve your traffic, get very active marketing your blog. Comment on lots of other blogs, interact more on social media, participate on forums, guest post and do anything else you can to get your blog name out there. On top of that, ensure you are writing quality content with intriguing titles. Ideally that content is optimized for keywords that get a decent amount of searches but aren’t too competitive. As for user engagement, an advertiser may look at how many comments you receive on posts, as well as social shares for each post. The number of people following you on social media or via RSS is important too. Those kinds of metrics can be padded by cooperating with other bloggers, but for long term success you’ll want to again focus on creating the best possible content. By interacting more on social media sites you also increase your chances of getting shares. For more about blog statistics, refer to my post about the importance of blog statistics. Besides improving various stats, it helps to make it more obvious to advertisers that you accept advertising. This is where you have to walk a fine line since Google does not want you selling links that can help an advertiser’s PageRank. On the flip-side, advertisers are looking for those exact benefits. So know that you are risking things with Google if you choose to go that route. The first way you can give advertisers hope is by creating an advertising page, but be very careful about your wording regarding the type of ads you accept. You don’t want to give Google explicit evidence that you are trying to violate their terms of service. The more subtle approach is to create a guest post policy page. The problem is that with that approach you could very well get more marketers trying to scam free advertising. Next you can simply accept more guest posts and label them as such. There are some advertisers that search Google for something like “guest post” + their target keyword. So the more guest posts you have on your blog, the better the chance of showing up for those kinds of searches. The extra benefits of that strategy is that you get free content and build connections with the guest writers. Lastly you can work with an ad broker that will help negotiate ads on your behalf in exchange for a small commission. Get in contact with me if you want a referral to a good ad broker. Now there very well could be other factors that certain advertisers take into consideration. Things like blog design, writing quality and image quality could all make a better first impression with advertisers. 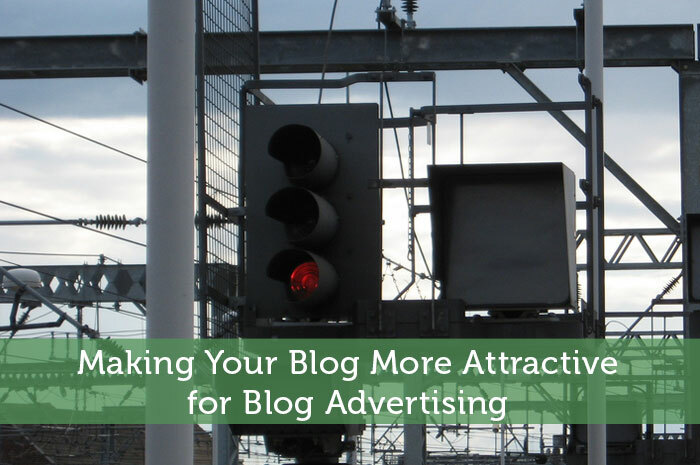 If your blog looks low quality, don’t expect an advertiser to pay much for advertising. Work on making your blog attractive to advertisers and you’ll find that you’re improving your blog for everyone…your readers, search engines, other bloggers and even yourself. You might even find that you improved your blog enough to not want to risk getting on Google’s bad side. Then you could pursue even more lucrative monetization strategies. Do you feel that your blog is well optimized to impress advertisers? Is this something that you are concerned about? Nice article again Jeremy. This information is eye opening. I will be contacting you about an ad broker soon. Thanks again for putting this together. No problem Grayson. In your case it’s really only your PageRank that’s holding you back for this kind of stuff. I suspect you’re one of those blogs that has their PR held back due to some kind of onpage issues. Nice post! I like the guest post approach. I would also say that pricing is important. I’ve noticed that some of my prices from last year are not flying this year, so it’s important to adjust prices as the market dictates but at the same time not sell yourself short. Pricing can be a challenge for sure. By asking around and doing some trial and error you should find a level that you are comfortable with. You do have to balance things out so that you get a worthwhile price but still close the amount of ad deals that you are after. Thanks for another post on this area Jeremy! From my experience, I am seeing more and more focusing on DA and PA as opposed to PR. Like you said, regardless of which they’re looking at you need to continue marketing and building up those links. Good point on the advertising page, I always struggle as to what exactly I should say on mine. Yes it does seem that DA & PA are gaining steam among advertisers. I guess more and more are finding out how strong a metric it is. With your advertising page it is best to leave it somewhat open ended. That way they are more likely to contact you about different kinds of ads. This is the best explanation that I have seen on Page Rank. Now I see the #1 reason for having a high page rank no one I’ve spoke to about this previously could really give me a useful answer. I’ll have to bookmark this for future reference/example. I have to admit that the PageRank explanation was rather simplified. There is more to it than that, but that is the bare bones of it. In addition to impressing advertisers, a high PageRank often makes other bloggers more likely to do work with you. Plus it is a sign that you are building backlinks to your website that Google values. It’s almost as if you’re writing these posts specifically for me while I go through this process. Seriously, thanks so much for imparting all your wisdom! In that case let me know what topic you want covered next in case my psychic abilities fail me next week. I’m glad to hear that this series is being helpful. It’s a great post, I forgot about some of these things sometimes. I didn’t know about the domain authority thing; it’s neat to see another stat on how well/bad my blog is doing. Domain Authority is something you should pay attention to if you care about advertising or search engine traffic. The company that created that metric is one of the more reputable SEO companies out there. So it should be a fairly accurate representation of your blog’s actual SEO strength. Hey Jeremy! Though I’m still pondering if I wanna include ads in my blog, I do think that you’ve provided good and useful information for someone who’s new to blogosphere. Thanks! Thanks Janice. While this post is focused on attracting advertisers, these kinds of improvements will also help search engine rankings. So it’s something everyone should keep in mind. It is definitely worth pursuing if you’re finding you have more free time. Beyond the side income, there are all kinds of other benefits that a lot of new bloggers don’t expect. Let me know if you ever have any questions about blogging. That’s not surprising at all. An advertiser might check out those pages, but then go on to poke around your blog before contacting you. Then there are the ones that automatically mine ad prospects with software. That software likely detects your contact page. Great tips as usual. The pagerank is one of my goals, as I know that it means I am getting recognized and getting exposure. My Alexa leveled off around 120,000, and can’t seem to get it going. I don’t want to spend too much more time blogging than I already am, so trying to optimize my time. Plus, I have a bunch of junk to say on my blog that I saved up for months and months during tax season. A lot of writing to do. It is tough to get your Alexa lower while also limiting time/effort. The two correlate quite well unless you manage to find creative ways to get your name out there more. I suggest guest posting on some popular blogs to leverage different groups of readers. That will also help your PageRank by getting some quality dofollow links. With ads you can always insist that you write the ads yourself. I like that “Open Site Explorer” and thanks for explaining in such detail. I’m starting to understand it better. I’ll also be contacting you offline for the ad broker. Of course you know if you’re still not sure about anything you can e-mail me. At least you know what to do when you do come across some extra free time. Perhaps next week’s post will be about maximizing time efficiency. One of these days I’ll have to compile all this stuff into an ebook since it seems to be helping everyone. If only I didn’t have so much on my plate already. I always appreciate these articles you post! I still have so much more to learn about optimizing my blog! I’m hoping my PR rank stays, and trying to improve the rest of the numbers. As long as you stay active marketing your blog, it’s unlikely that your PR will drop. If that is a concern, you might want to make extra effort to get some extra dofollow links, especially in the next week or so since PR will likely update early next month. Thank you! This is something I know next to nothing about, so these posts are very helpful. Yeah I figure most newer bloggers would be a little lost in this area. I know it’s the kind of thing that a lot of bloggers tend to ask me via e-mail. I’ve been a huge fan of this blog’s layout–very clear. Your PageRank link is a huge help. Thanks! Great series, and fantastic explanation for what advertisers are looking for in a site. At this point in my blogging “career” I am not quite focused on advertising, but am slowly preparing things for that by updating from a free theme and trying to write solid content. Once things get further along I will “green-light” with a guest post and advertising pages. It is best to focus on your blog and marketing for the first while. So keep that up at least until your stats improve. Since advertisers are looking for certain stats, you might just get disappointed if you try to pursue ads early on. You don’t want that distraction either. If you’re looking to improve PR, pay attention to Domain Authority too. It might actually be more revealing as to whether your efforts will help your search engine rankings. Plus it updates much more often. As for lack of time, watch for my post next week. I’m think of addressing time efficiency in blogging. Thanks Jeremy. As I begin to think about how I will monetize my blog, I am getting a little overwhelmed. These articles really help out. No problem Nick. I’ll try to cover some other blog monetization strategies in future blogging tips posts. I don’t agree with all of it and will endeavour to leave this page open to remind me to post when I have time to do so. But a lot of really useful information here. I’d be interested to hear what part you don’t agree with. What do I know after 12+ years of doing SEO? 😉 Let me know when you do your post so that I can learn a thing or two. Great Advice I want to build my blog and this will help me. Good to hear EL. That’s exactly what this series is for…to help out fellow finance bloggers. Actually to help other bloggers in any niche. I’m already being approached by some solid advertisers. I do disclose that my blog is VERY new and so has low traffic at the moment–for initial “due diligence,” they tend to just click through a site and look at the quality of the articles and user engagement, etc. It really depends on the advertiser when it comes to what they’re looking at in an advertising target. I’d think it would be quite rare for them to not look into a blog’s stats before placing an ad. Great insight Jeremy–thanks for writing this. Have you seen some advertisers pass up on PR3 b/c their DA and PA is low? Yes that does happen. I see some advertisers not even caring about PR and instead focusing entirely on DA & PA.
Hi Jeremy, This is the first time I am visiting this site. I am really impressed with the amount of effort you put into writing this blog. It is lengthy but you’ve made it more reader-friendly by keeping the concepts more simple. As a blogger myself, I know the complexity of gaining traffic to the blog. I hope content writers take their writing more serious and acknowledge the fact that organic traffic can only be achieved by creating quality content. Great post. Quality content is extremely important, but as a SEO pro, I know that’s not the only path. It is still easy enough to trick search engines into thinking that your content is strong enough to rank well. Those rankings are a lot easier to achieve if your content is solid though.